Qingdao TAFCO Food Co., Ltd.
Seasonings are essential for the creation of delicious food. Indeed, there are a wide variety of seasonings. The production of seasonings that end up as subtle flavors or different tastes requires high levels of R&D and technology. TAFCO offers liquid seasoning such as the vegetable essence of Chinese cabbages, onions, etc., which are created by using hot water to extract and condense the raw materials and the essence of fish and shellfish such as Japanese littleneck clams, in addition to powder seasonings that are produced by drying liquid seasonings. These seasonings maintain the natural flavor of the ingredient and are widely used in many dishes, including ready-made food such as retort pouches or delicatessens, seasonings for home cooking such as dipping sauces, gravy and sauces, various kinds of soups, ochazuke (Seasoning for rice soaked in tea), sweets and paste foodstuff. TAFCO’s seasonings are widely used as an essential ingredient to enhance the taste of dishes. The quality is simply the most important topic for a food company. At TAFCO, freeze-dried and air-dried products, which can be stored for long periods of time, are exposed to proactive and very stringent checks. Many different criteria are required from the selection of materials to the finished products, which is our motto to ensure better quality control. TAFCO’s dehydrated food products such as dried salmon flakes are enjoyed by lots of people in many different ways including ochazuke, furikake, instant noodles, miso soup and other types of soup. We totally and consistently manage our processed marine products from raw material form to final products and strive to develop reliable and safe products for customers. In response to the globalizing environment of food market, we establish our sales and marketing strategies for products that are preferred around the world, as well as for Japan. Akatsuki Gyorui Co., Ltd. is a domestic Japanese processing company that belongs to the TAFCO Group. 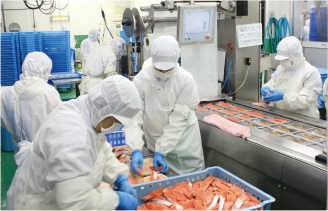 Using the latest processing facilities, the company manufactures sliced portions and their marinades from fishes that we caught or purchased for co-ops and mass retailers. Under strict quality and sanitary control standards, in addition to food defense standards, we take every measure to realize our fundamental philosophy of “providing wholesome, safe and healthy food.” Taking advantage of our convenient location in Sodegaura City with its easy access to the Tokyo Bay Aqua-Line and Tokyo-Gaikan Expressway, we deliver products all over the Tokyo Metropolitan area.